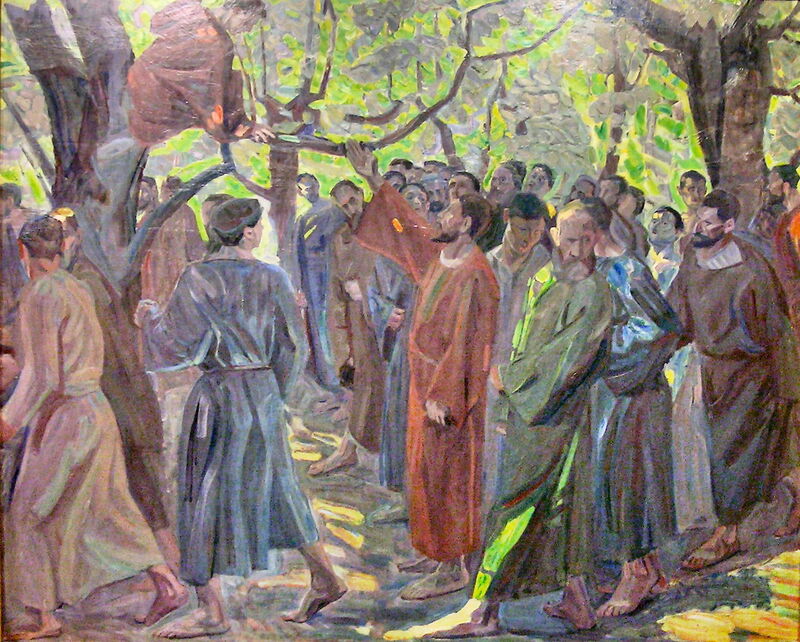 Zacchaeus climbed away from the crowd and saw Jesus without the crowd getting in his way. The crowd laughs at the lowly, to people walking the way of humility, who leave the wrongs they suffer in Gods hands and do not insist on getting back at their enemies. The crowd laughs at the lowly and says, ‘You helpless, miserable clod, you cannot even stick up for yourself and get back what is your own.’ The crowd gets in the way and prevents Jesus from being seen. The crowd boasts and crows when it is able to get back what it owns. It blocks the sight of the one who said as he hung on the cross, ‘Father, forgive them, because they do not know what they are doing… He ignored the crowd that was getting in his way. He instead climbed a sycamore tree, a tree of ‘silly fruit.’ As the apostle says, ‘We preach Christ crucified, a stumbling block indeed to the Jews, [now notice the sycamore] but folly to the Gentiles.’ Finally, the wise people of this world laugh at us about the cross of Christ and say, ‘What sort of minds do you people have, who worship a crucified God?’ What sort of minds do we have? They are certainly not your kind of mind. ‘The wisdom of this world is folly with God.’ No, we do not have your kind of mind. You call our minds foolish. Say what you like, but for our part, let us climb the sycamore tree and see Jesus. The reason you cannot see Jesus is that you are ashamed to climb the sycamore tree. The Lord Jesus is always ready to make his home with each one of us. Do you make room for him in your heart and in every area of your life? El Greco painted several versions of this scene. Here we see an early one before 1570, now in Washington DC, and one in his mature Mannerist style from about 1600, now in London. 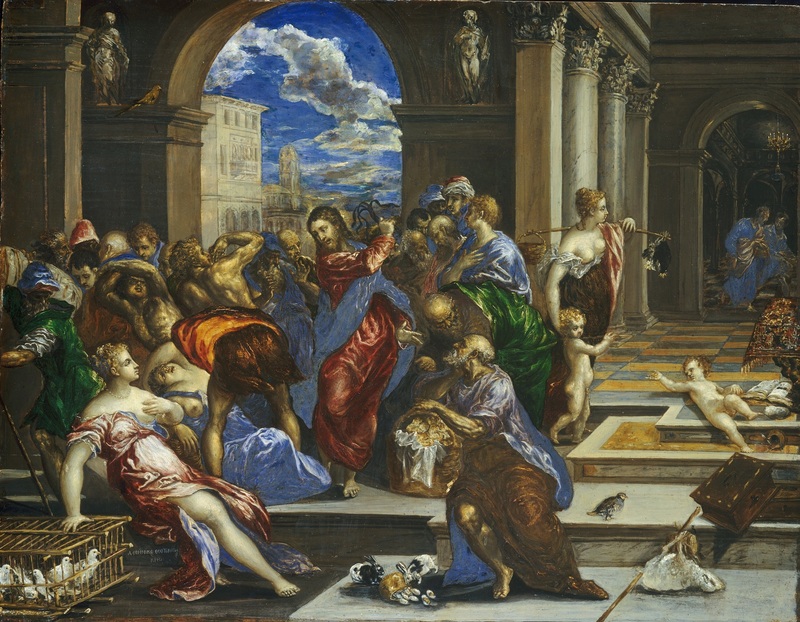 “In this tempestuous scene, El Greco depicted an angry Christ driving the moneychangers from the Temple. An uncommon theme, it became increasingly popular in the latter half of the sixteenth century, promoted by the Council of Trent as a symbol of the Catholic church’s attempt to purify itself after the Protestant Reformation. Here El Greco portrayed partially draped women and bare-chested men writhing and twisting to escape the blows of Christ’s scourge, emphasizing the agitation of the participants and exaggerating their irreverence. The setting is one of classical grandeur, more reminiscent of an Italian Renaissance palace than of the sacred precincts of the Temple in Jerusalem. 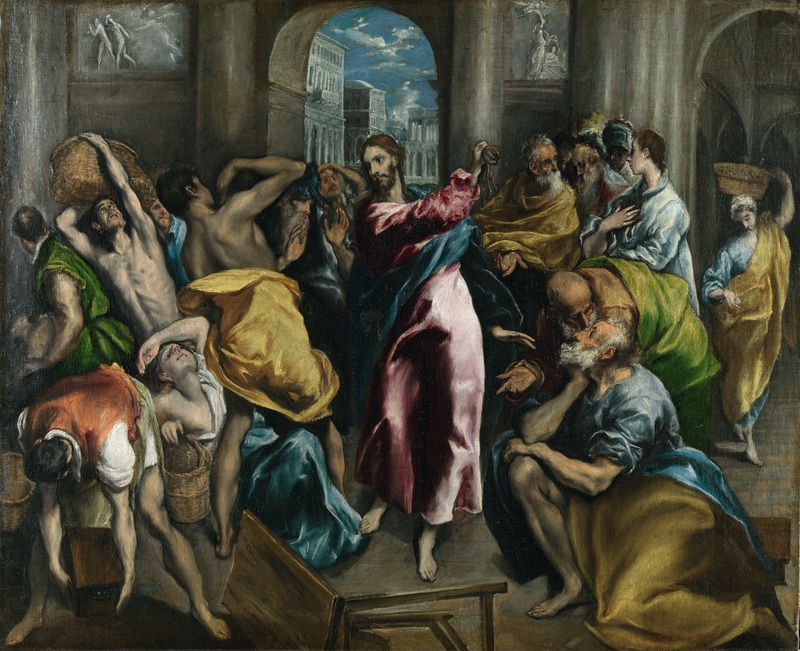 Christ driving the Traders from the Temple, El Greco, circa 1600, oil on canvas, 106.3 × 129.7 cm (41.9 × 51.1 in), National Gallery, London. “In the time of Christ, the porch of the Temple in Jerusalem accommodated a market for buying sacrificial animals and changing money. Christ drove out the traders, saying, ‘It is written “My house shall be called a house of prayer”; but you make it a den of thieves.’ (Matthew 20). This episode is known as the Purification of the Temple. The picture is dominated by the figure of Christ, poised to unleash his whip. On the left are the traders and on the right are the Apostles. In the 16th century the subject of the Purification of the Temple was used as a symbol of the Church’s need to cleanse itself both through the condemnation of heresy and through internal reform. The reliefs in the background allude to the themes of punishment and deliverance. 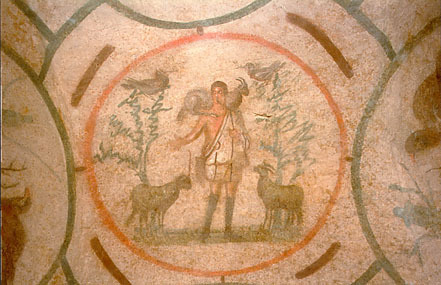 On the left Adam and Eve‘s expulsion from Paradise prefigures the Purification of the Temple, and on the right, the Sacrifice of Isaac prefigures Christ’s death as the source of redemption. For an article on El Greco’s several versions, click here. With this reading I was reminded of the recent attempts by Pope Francis to reform the Vatican’s finances as well as his critique of the excesses of capitalism. May the Lord bless and protect the holy Father in his attempts to cleanse the Temple!